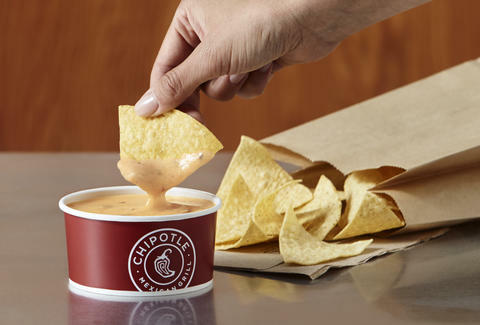 When Chipotle unleashed its first-ever queso dip as part of a test-launch at more than 350 restaurants back in late July, the burrito company strongly hinted it'd be only a matter of time before you could order the spicy cheese sauce all across the country. Well, that time is -- finally -- about to arrive, so get your damn chips ready, people. On Tuesday, Chipotle announced it will officially add queso to its menus nationwide on September 12. The chain said it finally cracked the code on creating a queso recipe that -- like its other menu items -- is made with simple ingredients free of artificial flavors or colorings, artificial preservatives, and other industrial additives. However, Chipotle said it has slightly tweaked the recipe ahead of the wider rollout based on feedback from customers during the expanded test launch. So, if you've managed to taste Chipotle's queso before now, the final version may be a bit different when the hot cheese tidal wave hits your local outpost. Chipotle actually details every ingredient it uses in the queso via a simple visual chart on its website, including aged cheddar cheese, tomatoes, tomatillos, milk, seasonings, and multiple types of peppers. You can expect to order queso just like you already order guac at Chipotle. You can add it to your burrito, burrito bowl, or other entree for $1.25 or you can order it on the side with chips in two sizes, the larger of which will set you back $5.25, although prices will vary by city. Unfortunately, it doesn't look like Chipotle is celebrating the big launch with free queso or buy-one-get-one (BOGO) deals, but considering the numerous free food promotions it has launched in recent months, it probably won't be long before you can score some for free. All said, Chipotle is serving queso. Finally. Tony Merevick is Senior News Editor at Thrillist and fears his burrito bowls will never be the same. Send news tips to news@thrillist.com and follow him on Twitter @tonymerevick.